The Baby Natalia Living Room Group by Coaster at Wilcox Furniture in the Corpus Christi, Kingsville, Calallen, Texas area. Product availability may vary. Contact us for the most current availability on this product. Leg or Skirt Solid Rubber wood. Frame Construction Kiln dried solid Eucalyptus wood frame. Padding & Ergonomics Button tufted seat and back. Seat Support Pocket coil seating and sinuous spring base. Crafted from a solid wood frame, the Baby Natalia collection features upholstered seating for your living room space. Showcasing mid-century modern style, the furnishings feature a tufted back and splayed solid wood legs with flare tapered arms. 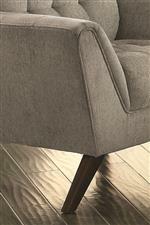 Elegantly-styled, this collection fits well within a smaller condominium or apartment setting. The Baby Natalia collection is a great option if you are looking for Mid-Century Modern furniture in the Corpus Christi, Kingsville, Calallen, Texas area. Browse other items in the Baby Natalia collection from Wilcox Furniture in the Corpus Christi, Kingsville, Calallen, Texas area.